It is fair to say having a complaint made against you that alleges you are guilty of “professional incompetence” must be pretty stressful. Margaret Coats and her team of Rottweiler’s spend 18 months putting a case together. Then some months ago they would have allocated three days in September for the hearing, appointed a panel and a legal assessor to hear the case. At the outset of the hearing the GCC informed the Committee that it would not be offering any evidence in relation to Particulars 5(b) and 6 of Allegation A and Allegation B in its entirety. The Committee therefore found those matters not proved. and it therefore finds the Allegation not proved. No one is responsible for wasting your time, not one is responsible for taking 18 months out of your life and bring untold misery upon your family. This has been going on now for 10 years and chiropractors pay their registration fees every Christmas like the proverbial turkeys and do nothing thinking it wont happen to them and now it has happened to the majority of chiropractors they respond by keeping their heads down. Margaret Coats will say these case come before the Professional Conduct Committee because the PCC have to sit when the Investigating Committee decide there is a case to answer. 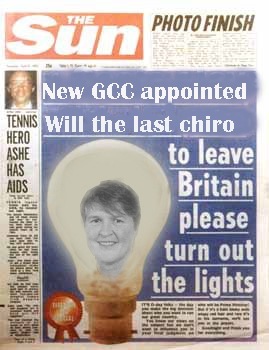 The Osteopaths do not interpret their act in this manner, the GCC interprets the act this way, because Margret Coats went and got a legal opinion which stated “case to answer” rather than seeking the legal opinion the Osteopaths got which would have enabled the IC to weed out cases like Alan Scotts and the skeptics vexatious complaints. I was the only person on council to question this legal advice, to be told this opinion was from an eminent QC, to which I remarked opinions are like noses, we all have one. These cases against innocent chiropractors will be rightly removed from the GCC website in a few weeks, however chiropractors looking at the proved cases on the GCC website should not forget that Margaret Coats way of bringing these cases to the IC has brought untold misery to as many inocent chiropractors and there is a better way of doing it as the osteopaths have shown. Margaret Coats enthusiasm for bring cases to the PCC is legendary and now they are threatening a witness’s who don’t wish to continue with her complaint against a chiropractor with a fine of £5,000. The majority of registered chiropractors have to find their common ground and present a united front to the regulator regarding their demands. The BCA and the Alliance have to work it out their differences and find common ground, or say we are not one profession, in which case the Alliance and BCA members should be regulated as seperate professions by the Health Professional Council who regulated a number of different professions. I can see the GCC presenting this vote of confidence as a rogue element within the BCA, believing they have the Alliance on side now they have given ground on subluxation. That was my big concern about that meeting in September, the GCC needed breathing space and the Alliance has helped them. The members of the Alliance should now move to also call for votes of confidence in the GCC. The funny thing is even though these votes are from a much smaller group than the previous vote of confidence http://www.chiropracticlive.com/?p=112 it caries much more political weight. If the associations can work together for a common purpose, then the question is what gives chiropractors leverage with the GCC. Money, the registration fee, so fees could put into an escrow fund and the leaders and the CPA negotiate with the regulator, the GCC could approach the Privy council for an amendment to the chiropractic to allow these negotions to complete as they did when defering registration fees for chiropractors under investigation. Presumably the profession would want rid of Coats and Dixon and other members with a history of political activism, its for chiropractors to decide what they want and what a chiropractic profession is. 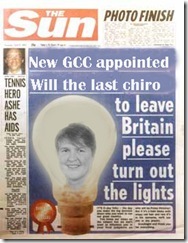 Bearing in mind your headline “the GCC is not fit for purpose. How many times do chiropractors need to be told this before they act?” what would you like to see chiropractors do? All deregister? Refuse to pay their registration fees? Send in a SWAT team? I get the impression that you’re not impressed by the newly formed Alliance. We certainly have a cause but what are we going to do about it? What would anyone else like to see happen? Thanks for that summing up of my case. To say I’m not impressed would be an understatement. The GCC knew for weeks that they would not be offering any evidence in two thirds of the allegations they made up against me. They could offer no evidence because their expert witness backed up most of the things I said. Despite that and after many emails, letters etc by my solicitor to the GCC’s legal team they still refused to reduce the length of the hearing from four days. So I had to take a whole week off work for nothing. When we got to the hearing the legal assessor asked my legal team why it was slated for so long!! Then after only two hours, basically the complainant gave his evidence that was pretty much what was in his statement, the GCC barrister approached mine and proposed to withdraw the case as it was clear there was no case to answer and their expert witness felt he could not give evidence given the comments that the complainant made. So a case that should never have been brought was over in two hours. I believe that had the Investigating committee read and interpreted the complainant’s statement correctly, had they asked him to clarify a few points in his statement and importantly had they sought expert advice before deciding to proceed this could have been avoided. Also if they had a mechanism to review and dismiss a case as more evidence comes to light they could have saved themselves and me a lot of stress and worry and cost. Indeed like other cases Richard has commented on the complainant in my case wrote to the GCC pretty much wanting to pull out but had it gone so far that he was told he would have to appear. It seems they take no responsibility for their actions and at minimum they should be made liable for the Chiropractors costs if he is found not guilty. That might make them consider the cases they bring more carefully. I wonder what review process they use to improve the standard of cases they bring? So yes, I am angry to say the least. And to top it all the way they word the findings make it seem that I could have been guilty but they did not manage to get enough on me, rather than holding their hands up and saying there was no case to answer. But mine was nowhere near a bad as the one before me where the GCC legal team were, I have heard, wrong on several points of law and had to be corrected. So the GCC have lost three cases in the past month and even worse have brought cases that did not have any public protection issues and did not serve to uphold the integrity of the profession.